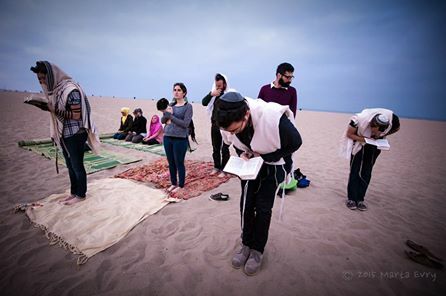 The following is Andrea Hodos’ account of our experiment in shared prayer at the Fall 2014 retreat for NewGround: A Muslim-Jewish Partnership’s Professional Fellowship. At our first retreat in November, our NewGround cohort prays together for the first time. It has been an intense couple of weeks in the world. The month began with the assassination attempt on Temple Mount activist Yehudah Glick, and several Israeli Knesset Members calling for renewal of Jewish presence on Har Habayit/Haram Al Sharif. The attack on the Har Nof synagogue occurred only three days ago. The religious nature of the conflict feels like it’s rising to the foreground right now. Several of us remark that – ironically – we are looking forward to this gathering of our Muslim Jewish cohort as a refuge. Friday evening, we begin with a presentation by the Jews to the Muslims about Jewish prayer and ritual, loosely built around Kabbalat Shabbat (the service through which Jews welcome the Sabbath). The Jews have spilled much virtual “ink” negotiating how to best represent Judaism, Jewishness, and Shabbat practices to our counterparts. The Muslims seem to have effortlessly and peacefully pulled together their explanation of Islamic prayer and what these prayers mean to them. We learn a bit about the meaning of the prayers, and then they join together in the Isha prayer. I watch the prayer up close and a slight crack in the code is revealed for me. The sounds of the prayer are beautiful and now I have a sense of its meaning. As a dancer, the gesture of the prayer moves me most. I watch my friends as they receive, connect, submit, rise. What a privilege to be invited into the intimacy of this relationship . . . The next afternoon, as some of the Muslim members of the cohort prepare for the Maghrib (evening) prayer, one of the Jews asks if those of us who want to pray Ma'ariv, our evening prayer, could share the space. So we pray together. There are not enough Jews for a minyan (prayer quorum), so the voice of our combined prayer is the voice of the Adhan (call to prayer) but the hands are the hands of everyone – some hands holding siddurim (prayerbooks), some held to ears, some resting on chests, bodies swaying, stepping backward and forward, knees bending, foreheads pressed to floor. For me, there is a deeply resonant call and response between the words I am saying and words I am coming to know. And we are moving together. I imagine our prayers might be making God especially happy right now. A group of us gather early on Sunday morning for prayers. It is the final day of the retreat. At this point, I have engaged in serious conversations with almost everyone in the room. After discussing our mutual ambivalence about Thanksgiving celebrations, one of my new friends and I have tentatively begun sharing our heartbreak over the war in Gaza this past summer. Later in the fellowship, hers will be the voice I hear most strikingly in our Islam 101 session, just days after the Charlie Hebdo shootings, “This beautiful portrayal of Islam we are hearing tonight is the Islam I fell in love with. I can’t help but feel so sad that something this beautiful is being made so ugly right now.” In our Sunday morning prayers, the call “Allahu Akbar” (God is Great) inspires me as it blends with my whispered “Adonay Eloheinu, Adonay Echad”(God, Our God, God is One) -- but for a moment I remember that for so many people who are otherwise unfamiliar with them, these words inspire fear rather than reverence. We hear them only in news reports. These words, now evoking peace and unity for me, have become a short cut for film and TV writers to indicate to their audiences that they are on the verge of something very violent. Throughout the weekend we have been protected against whatever events might be transpiring in the outside world. It’s not that I’ve forgotten what’s going on, but in our refuge, I have been focusing on other questions: What is my predominant conflict style? As a religious Jew, how do I make sure I don’t eclipse the Shabbat observance of secular Jews? How do I begin to understand the differences in the culture of Iranian Muslims, Malaysian Muslims, Pakistani-Texan Muslims and Palestinian-Puerto Rican-American Muslims? But as I step forward into the Amidah, the world crashes back in. The shocking images of the bloodshed in Har Nof, the provocative calls for Jews to reclaim the Temple Mount, reverberate inside me, and I understand that I am in a sanctuary praying with Jews and Muslims . . . in the very moment that my prayer is about Muslims and Jews killing and terrorizing one another over who can pray where. My heart simultaneously breaks and breaks open. It strikes me our prayers are not making God happy right now. In this moment, I imagine our prayers are consoling God. So much so deeply broken. Here we are, picking up just a few of the far-flung shards and trying to put them back together -- through our connection, and with our compassion.